Lovely pale pink tumbled specimen of Kunzite from Afghanistan. Quality specimens of Kunzite are becoming quite hard to find but this is a super piece. In the flesh this piece is more translucent with a beautiful soft colour plus it has a gentle sparkle. Kunzite is the pink variety of Spodumene (the green and much rarer type is called Hiddenite). The most popular type with healers is the pink (getting its colour from its Lithium rich content) - ranging from a real blue/rose pink through to a beautiful violet pink. It is an extremely peaceful and spiritual stone which awakens the heart centre promoting unconditional love. It is an excellent aid for those who find meditation difficult and is a very protective crystal. It is said to be able to dispel negativity and just having it in your auric field is enough to cleanse your aura. 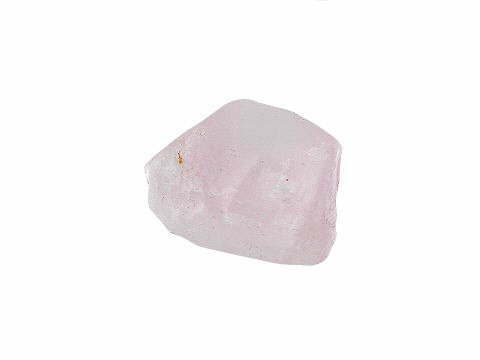 Kunzite is also excellent for premature babies who are having difficulty adjusting to early life outside of the security of their mummy’s tummy. Best placed under the baby’s mattress, well out of reach, or placed on a table adjacent to the baby’s cot. As with all babies and small children, care must be taken with crystals to avoid choking. Never leave a young child unattended with a crystal.